Bearing the airline’s distinctive livery the first A380 for Thai Airways International has rolled out of the Airbus paint shop in Hamburg. Assembled in Toulouse all A380s are flown to Hamburg for painting and cabin installation. British Airways has announced its winter domestic programme, marking the major part of its rescheduling following the takeover of bmi. The airline has already taken over bmi’s six daily flights to Belfast, and will be launching a new timetable of seven services between London and the Northern Ireland capital on 28 October. 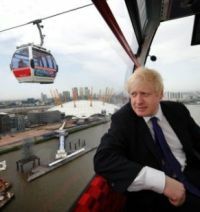 Mayor Boris Johnson and Emirates CEO Tim Clark last Thursday inaugurated the Emirates Air Line, the new Thames gateway and destined to become a major tourist attraction for London in its own right. It offers terrific value, with each journey from £1.60. Operated by the DLR the nickname ‘Docklands Light Ropeway’ has already stuck. The drivers’ list may have been a who’s who of the last 60 years, ranging from Sir Stirling Moss to Sebastian Vettel, but there was only one star at last weekend’s Goodwood Festival of Speed, the stunning new Jaguar F type. Following the demise of Swedish carrier City Airlines, Danish airline Sun Air, operating as a British Airways franchise partner, will take over the Manchester – Gothenburg service from the 27 August 2012 with 11 weekly return flights. And TAP is increasing flights. 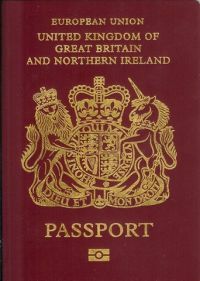 UK nationals planning to travel this summer should make sure they don’t fall at the last hurdle by planning ahead and avoiding using the London Passport Office during the 2012 Games, the Identity and Passport Service (IPS) has warned. The advice is to leave at least three weeks for IPS to process a postal application and longer if you are applying for the first time. 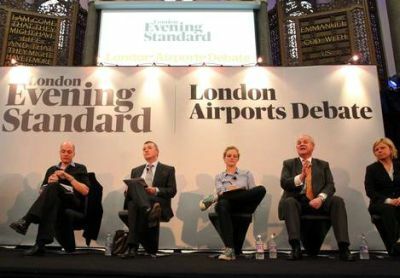 Willie Walsh and Brendan Barber, General Secretary, Trades Union Congress, could not be considered the most obvious of bedfellows but they got together at an Aviation Foundation Westminster media briefing last week calling upon the Government to adopt four key tests to secure a credible and lasting aviation policy. 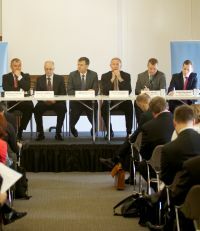 Joining them were Colin Matthews and Charlie Cornish, respective CEOs of BAA and Manchester Airports Group, Steve Ridgeway, CEO, Virgin Atlantic and John Longworth, Director General of the British Chambers of Commerce. The Azerbaijan capital Baku is booming, some would say in spite of its being the host for this year’s European Song Contest. Recent hotel openings have included The Four Seasons in June, and Kempinksi and Sheraton late last year. Joining these brands is the 243-room JW Marriott Absheron Baku under a management agreement with Yeni Absheron Oteli LLC. 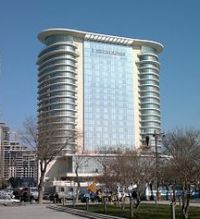 The hotel overlooks Baku’s famed Azadliq Square and the Caspian Sea. Tower Hamlets Mayor Lutfur Rahman has officially opened the London Whitechapel ibis budget hotel. 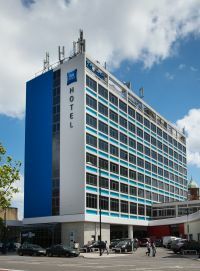 It is the first UK property to be designed specifically to meet the revitalisation of Accor’s economy hotel segment. 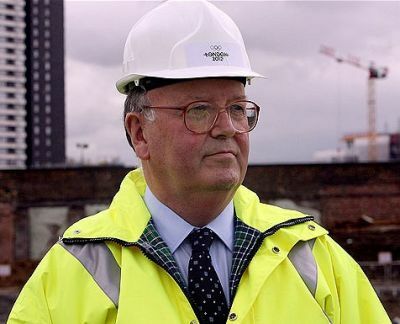 This change is currently underway with three brands ‘ibis’, ‘ibis Styles’ and ‘ibis budget’. Japan Airlines and ANA are both on the wi-fi trail with the former national carrier in the lead. Using a Panasonic system JAL will offer the service on flights between Tokyo (Narita) and New York (John F. Kennedy) on alternate days from 15 July 2012, and daily from early August. 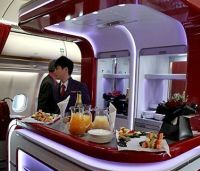 The airline expects to deliver this latest innovation on flights to and from Chicago, Los Angeles and Jakarta by the end of October this year, and London, Paris and Frankfurt by next spring. With just 27 days to go (as of Monday 2 July) East Anglia is getting excited at the prospect of the Olympics focusing on Stratford, the main railway station for the Queen Elizabeth II Park, which is the setting for the majority of the events. 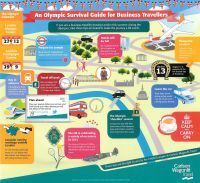 The region’s train operator – Greater Anglia – has printed and published a range of timetable booklets for the Games which are now available from staffed stations and on the website. Unless some legal impediment intervenes the sale of much of Plymouth City Airport’s working equipment will be auctioned off on 12 July. Alex Cruz is CEO of Vueling and is a US educated Spaniard whose home is in London. He is the guest of the Aviation Club at the Institute of Directors on Thursday (5 July). Vueling itself was launched as a budget airline in 2004, and merged with Clickair, a Cruz creation, in 2006. Last week Vueling announced that it has carried 50m passengers. It now describes itself as a “new generation” carrier and with a 91% point to point punctuality, and on some routes with half the passengers flying on business, it has certainly broken the budget mould, whilst still remaining low fare. With the Olympics coming up and London's buses the subject of debate we thought we might publish these words from a fine man of music who left us early aged 57. London City Airport (LCY) has come up with a new way of relaxing passengers before the hustle and bustle of airport security. It has created an art space in its pre-screening area, offering passengers – should they seek it – a moment’s pause for reflection before tackling that most daunting of airport inevitabilities. 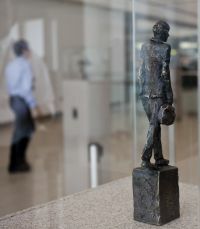 The space showcases an installation of 12 bronze sculptures, commissioned especially for the airport, which act as a metaphor for the passenger journey through the airport. FedEx, the cargo operator, has completed a deal with Boeing that will keep the 767 line open at Everett, Seattle, until 2019 at least. It is acquiring 19 additional Boeing 767-300 aircraft in addition to the 27 ordered back in December. Total sales of the aircraft are now around 1,140 with details of a major USAF order yet to emerge. Gatwick is now the home base for the third Hong Kong Airlines’ all Club Class Airbus A330-200 aircraft recently delivered. Not only will it act as a back-up for the two planes that have served the routes since March of this year but it will also be available as a very high quality charter aircraft offering both a short haul and long range capacity for up to 116 guests. The performances of the London airports were in sharp contrast last week when the passenger numbers for May were published. 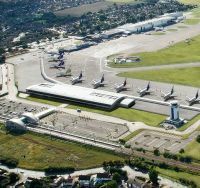 For Gatwick the results were positive, up 2% for the month and 4% on a rolling annual basis. Europe did best with a 9.3% rise on scheduled services. The trend to larger aircraft continued movements for the month down 1.2%. The airport could top 34m in 2012, getting closer to the 35.2m 2007 record. 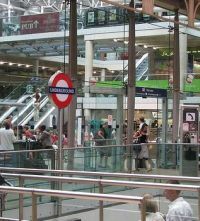 Heathrow Express and Heathrow Connect users should note that the Hammersmith & City London Underground section of Paddington Station has a newly built station entrance and concourse. 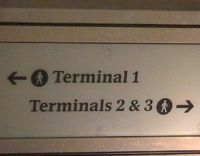 Passengers inbound from Heathrow at Paddington have a choice of Underground routes into central London, located in completely different parts of the main station. 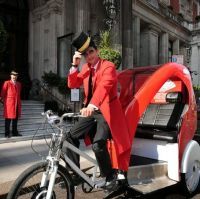 Situated in the heart of London's Knightsbridge, guests at Mandarin Oriental Hyde Park, will be one step ahead of the crowds and travelling in style in the hotel's bespoke rickshaw during the London 2012 Games this summer. Airlines continue to be less than forthcoming when it comes to route cancellations but we glean that Delta is to drop its five times weekly Detroit – Hong Kong service from 12 August. The near 16-hour flight commits at least two Boeing 777-200ERs which will presumably be freed up for other operations.